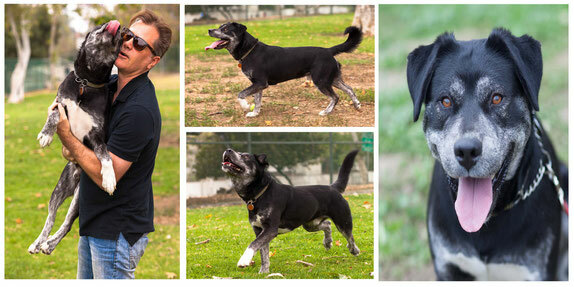 Rocco is young, 3-4 years old, and we think he's a Lab, Rottweiler, Queensland Heeler mix (the salt and pepper markings), and a perfect size at 53 lbs. Handsome Rocco, is genuinely always happy and loves to socialize. Rocco gets along with other dogs, and is currently living with many cats (but can get excited and chase if he has another dog partner). Rocco can be very patient. He does chill out and doesn't need to always be the center of attention. He has learned to sleep in a crate at night, although he does like to know where his people are. Like many dogs, he's fine waiting for his person to come home, but is not so fond of being separated from his people while they're at home. He's really a crowd pleaser. He does funny things and is famous for his "Roccogator" pose when he's bored. Rocco is a survivor! When he was rescued from the shelter, Rocco was 20 lbs underweight and weak. The shelter was not able to determine what the problem was. Dogzhaus took him to the best specialists. He had somehow developed a compromised liver which was extremely serious. Rocco rebounded, gained weight and is now strong and stable. He's now recovered and just gets periodic check-ups and is doing great on a hepatic diet which supports his liver and has allowed him to live a normal life. If you are interested in meeting Rocco please fill out our "Adoption Application".